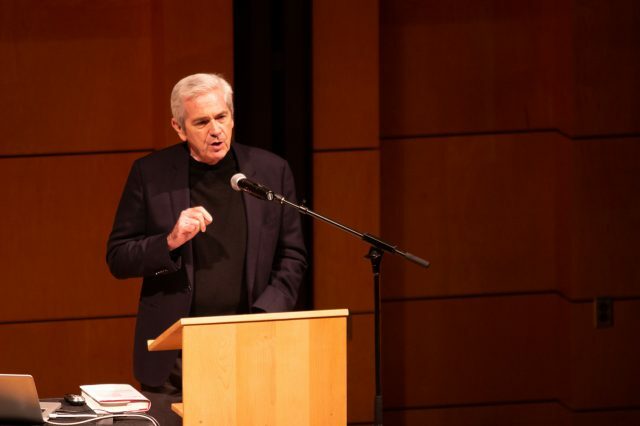 Tom Gjelten, NPR religion and belief correspondent, traveled from Arlington, Virginia to Goshen, Indiana on Monday to present the 2019 Yoder Public Affairs Lecture. The Yoder Public Affairs Lecture Series is an endowed lecture series, started in 1978 by Frank and Betty Jo Yoder, with the goal of bringing well-known speakers to talk about current events for Goshen College students, faculty, as well as community members. Gjelten gave a speech Monday night in Reith Recital Hall on the history of immigration in the United States and how law and culture have shifted, not only how many immigrants come to the United States, but also where the immigrants come from in the world. Referencing his 2015 book, “A Nation of Nations: A Great American Immigration Story,” Gjelten spoke specifically about the great American immigration story. “Gjelten did a great job of articulating the history surrounding some of the biggest issues that concern a large number of the people here at Goshen College,” said Bryce Stopher, a junior. Gjelten started with how, for a long time, foreigners were from nearly exclusively European nations, due to immigration quotas. These quotas also drove down immigration numbers from over 15 percent at the beginning of the 1900s to less than five percent in 1965. Immigration changed when President Lyndon Johnson signed into law the Immigration and Naturalization Act of 1965, which abolished immigration quotas and encouraged labor as well as reuniting families. Gjelten spoke on how Lyndon Johnson thought the bill “was not going to be monumental.” Gjelten went on to talk about how that changed the demographics of immigrants coming to the United States, from mostly European immigrants to immigrants from other parts of the world, including South America, Asia and Africa. The immigration numbers are rising again, Gjelten said, so “that within ten years immigrants will make up over 15 percent of the population again.” He finished by talking about how the changes in immigration will change America and make it a different place in the future than it has been over the last 200 years. The crowd in Reith was filled with students, faculty, staff and community members. The speech was given positive views from listeners.